A courtesy vehicle will pick you up from your Toronto hotel between 8:15am and 8:40am (depending on your hotel) and transfer you to your warm tour bus. 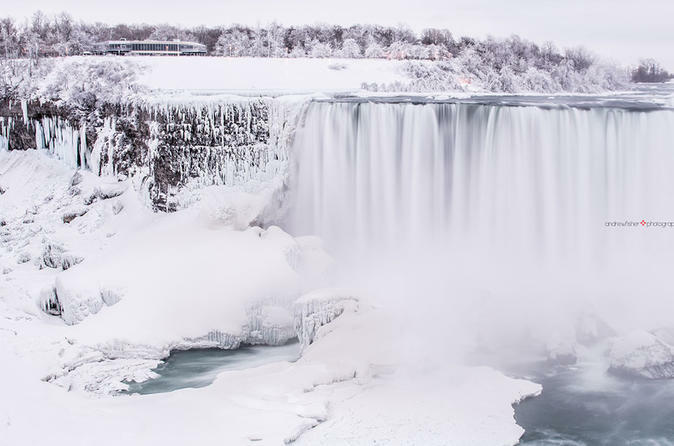 As you head to the Falls, a certified Niagara Falls Tour Guide will point out various points of interest. Once you reach Niagara Falls, you'll have 2.5 to 3.5 hours of free time to look around and explore. Visit haunted houses, wax museums, Skywheel, or even win big at one of Niagara's casinos. At an extra cost, you also have the option of enjoying an all-you-can-eat buffet lunch at the Sheraton Hotel or the Journey Behind the Falls. This tour also includes a 45-minute stop in the beautiful town of Niagara-on-the-Lake. Explore this historic town and take a walk down main street. Afterwards, visit a famous Niagara winery for a complimentary wine tasting.